What, when and where you want the service? In the beginning of the hackathon we got 5 different SDG-related ideas. After validating these with other Junction Tokyo participants, we saw that the biggest interest was for an app of offering different on-demand services, which could be offered by both professionals and freelancers, and where would not be any gender bias/discrimination. After next round of user validation interviews we saw that 2 biggest potential areas were massage and photography services (over 75% survey respondents). Once the validation was done we started the development process to make a prototype of the user version of the app, keeping in mind the anti-discrimination and gender equality principles for user journey. 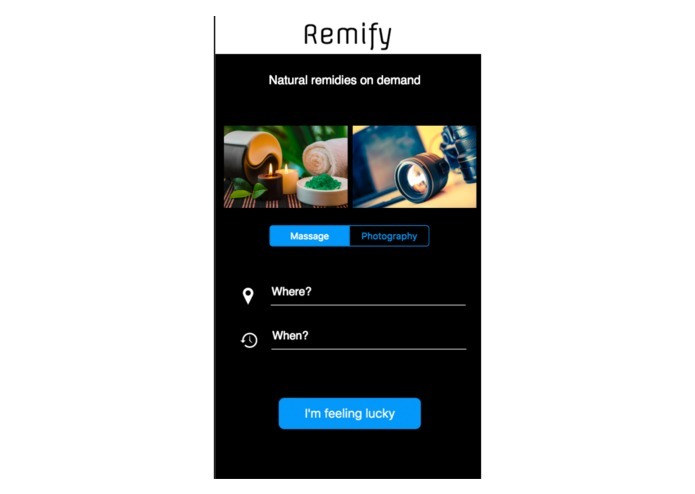 The name Remify comes from "Simplified remedy", on-demand service app, helping to solve your pain and troubles while looking for service providers in busy life. 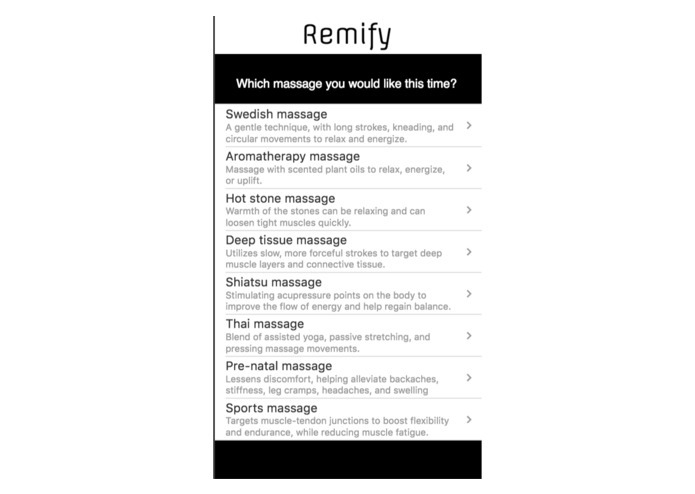 With Remify you can book on-demand professional services, starting with massage and photography (with other services identified in our market survey: housekeeping, personal trainers, wedding organisers, driving coaches, piano teachers, etc later to follow). 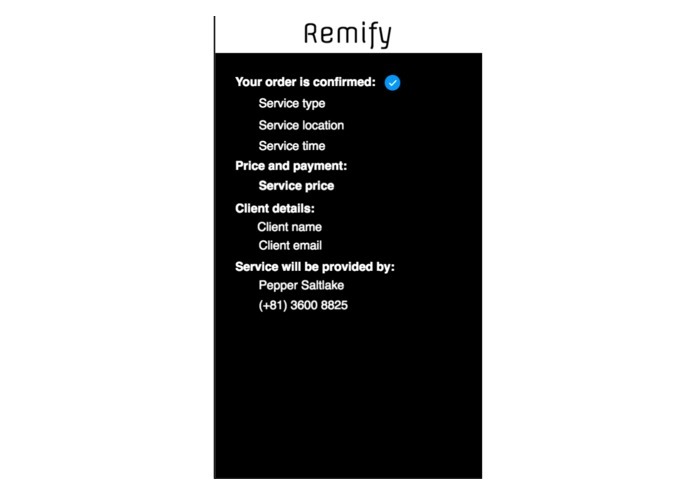 Remify is matching your needs with available professionals at the location and time you need. 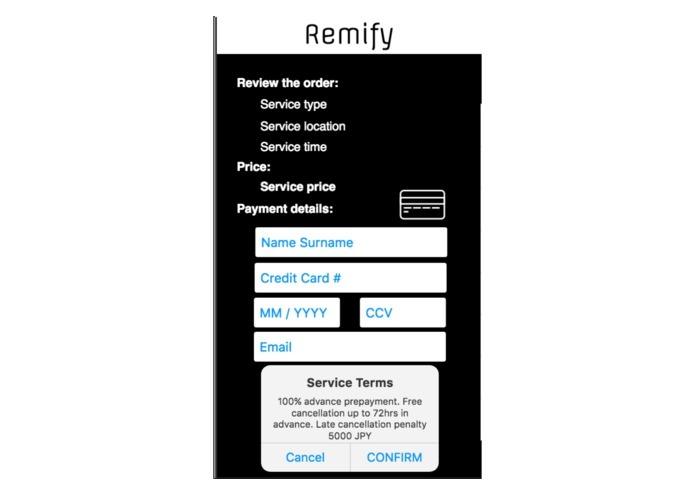 Unlike other platforms (TaskRabbit, DMMOkan, ServiceHero, DianDao) which show the profiles of service providers (including their gender) before booking, Remify offers equal treatment for all, matching the needs of professional skills only withholding discrimination. Based on the user interviews we designed optimal customer journey, sketched it on paper, then created a prototype on Proto.io and tweaked it to used on IBM BlueMIX platform. The biggest challenge in our team was our very limited technical/coding skills. We had quite a steep learning curve to climb. Initially we started with bootstrapping it on the usual HTML code and then saw that it would not work out with our skillset in the given time. Then we looked for ways to overcome the issue and discovered several web-based services, which allow prototype creation for mobile apps without advanced coding skills. Initially we tried InvisionApp, but it did not look too productive, so we looked further and discovered Proto.io, which let us focus on going further in the development. Once the prototype was ready the next challenge was to get it up on IBM BlueMIX. There was learning curve as well, based on the tutorials, after failing for hours, we finally got it up. We wanted to link it also with IBM BlueMIX database system, but that's still so the to-do list, we hope to solve that later. As a sideline, also there were no Japanese in our team, but we were developing a product, that would be launched initially on Japanese market. Thus, through the development process, we were looking for and communicating with Japanese participants of other teams, the volunteers and staff members to constantly validate our product market fit. Sometimes there were communication issues as we were all using different languages for communication, but eventually we got our messages through. Firstly, that we got a team together. None of us knew each other before, we just met at the slack channel of the event and then later in person at the hackathon venue. And it was a dream team: the team spirit was very high and we were very motivated, so that despite the limited technical/coding capabilities (none of us had developed sophisticated mobile app before), we managed as a team to overcome this challenge and got a working market-validated prototype. If there is a will, there is a way. When initially it seemed quite hopeless to get a working prototype in given time, then with good teamwork we found a way. We all learned more coding during the hackathon: using new technologies for the first time to build something. Never underestimate the potential yourself and your team. Talking and communicating with people around helps to validate your ideas - while we had a number initial ideas, this way we could find a way to get a product that actually has a market demand. We learned that as non-Japanese you can actually develop a product for Japanese market. In addition to being hosted at BlueMIX, to find the way get the database system/backend to work there as well. Compiling a fully functional MVP and launch it on the market. Besides Japanese market, also expanding it in other Asian and European countries.